Svari is a Nord child living in Solitude, and the daughter of Greta and Addvar. She is upset by the death of her uncle Roggvir, but upon further conversation she also explains she is worried about her mother, who has stopped going to the Temple of the Divines. Svari wears red colored child's clothes and a pair of shoes, and is equipped with an iron dagger. She carries a key to her father's house, a selection of food and toys, and a small amount of gold. If you wish to help her, it will start a miscellaneous quest to speak to Greta about Svari's concerns. Svari can sometimes be found running from the store Bits and Pieces towards Proudspire Manor while playing tag with some other children. 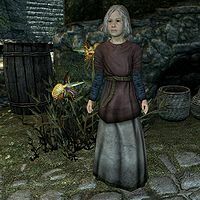 If Hearthfire is installed, and in the rare chance her parents are killed during a dragon attack, Svari can be found at Honorhall Orphanage in Riften and be adopted. Her dialogue will then follow the basics of other adoptable children, plus the dialogue of her uncle. If you approach her, she will try to dismiss you with "I... I don't want to talk. ", "I don't have anything to say. ", "Pardon me. ", or "Mother says I shouldn't talk to people..." When you end conversation with her, she may say either "Thanks for talking to me." or "For a stranger, you're not so bad." Should you converse with Svari, you can mention to her that she is talking right now, to which she'll reply, "I shouldn't be. Mama says if I do, people are going to ask about uncle Roggvir." or "I shouldn't be. Everyone wants to ask me about mama and uncle Roggvir." if both Greta and Roggvir are dead. Either way, she will end with "Maybe if I don't talk, they won't either." You can tell her, "Okay, if you don't want to hear about the dragon..." and she will lighten up: "Dragon?" You can then confirm that you were in Helgen when the dragon attacked. Svari will ask, "Really? Was it big? Did it breath fire?" You can reply, "Yes, yes, and yes. Oh my goodness, yes." She'll be amazed, saying, "Oh, wow. I knew it. I knew they were real! I have to remember to tell papa." "You may just have to give her time." "Yeah, that's what papa says too." "Maybe I could convince her." "You would do that? That's great. You should go do it right now." If you choose the latter option, you can now try to convince Greta to visit the Temple of the Divines. Return to Grace: Convince a mourning mother to go to the local temple. With Hearthfire installed, if you have given Svari at least one gold piece, she may ask you if you can adopt her, even if one or both of her parents are still alive. The option to do so will not be available unless she's actually orphaned, however. This page was last modified on 1 September 2015, at 00:40.